Prime Minister Manmohan Singh today announced a number of sops and initiatives for the benefit of overseas Indians. Ms Nivruti Rai and Mr Iftekhar Shareef from the US have become the first recipients of the much awaited Overseas Citizen of India (OCI) cards today at the inaugural day of the Pravasi Bharatiya Divas (PBD). The eviction of Punjabi and Sikh farmers from 1,200 acres of farmland, declared surplus following a Supreme Court order, has flared up into a thorny issue, here. Is the govt justified in cutting the public distribution system’s food subsidy? Fifteen Sri Lankan sailors were killed today when suspected Tamil Tigers blew up a naval gunboat in a pre-dawn suicide attack that caused the biggest military loss of life in a single incident since the Norwegian-arranged truce went into effect four years ago. 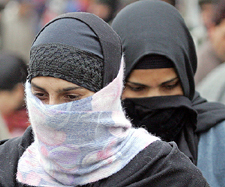 Temperatures in Adampur in Jalandhar district plummetted to a 34-year low of -4°C as severe cold wave conditions gripped most places in north India today. Prime Minister Manmohan Singh has approved the setting up of an Indian Institute of Science Education and Research in Punjab, an official announcement said today. The institute, which would come up near Chandigarh, would be the third in the series and would strive for global-level excellence in science research. The first two would be set up at Pune and Kolkata. Kickstarting the election campaign from the Majha region here, leaders at the SAD-BJP rally today vowed to take revenge by preparing a list of corrupt bureaucrats, police officials and Congress leaders. Political leaders gather at a SAD-BJP rally in Majitha on Saturday. The UPA government’s decision to cut Rs 4500 crore food subsidy will force the people below the poverty line to starve. 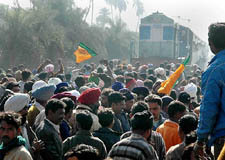 That’s the government, which came to power with the slogan “Congress ka hath, aam admi ke saath.” By its own admission, the government has stated that it is the faulty implementation of the scheme that the families under the BPL category are not getting the benefits and the middlemen are siphoning off of the grain meant for the hungry stomach.